The colliery was about four and a half miles S.S.E. of Stirling in the Parish of St. Ninians and was the property of the Plean Colliery Company, Limited in 1895 and provided employment for over 500 men underground. The daily output of the mine was above 500 tons. Originally Nos. 1 and 2 Pits were developed but these had not been worked for many years. As the workings extended, the No.3 Pit was sunk and this was the downcast shaft at the t me of the accident. in 1901-2, the No.4 Pit was sunk, 1,100 yards from No.3 and served as an upcast and coal winding shaft. The No.4 Pit passed through the Lower twenty-Inch Seam at about 166 yards from the surface and cut the Main Coal Seam at 194 yards. Both these seams were coking coal and two ranges of bye-product coke ovens were operated in connection with the colliery. At the time of the disaster, Mr. James Hamilton had been the certificated manager for almost three years. Before that he had been the undermanager of the colliery. Mr. Robert McAlpine was she undermanager and he held a 2nd. Class Certificate of Competency under the Coal Mines Act, 1911. 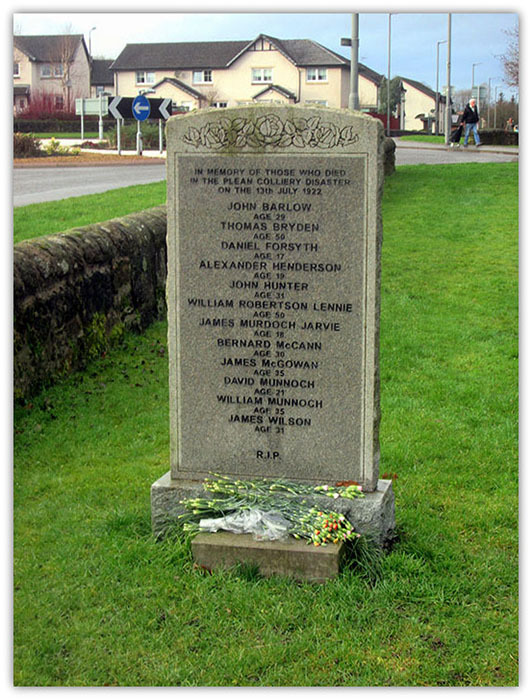 At the date of the explosion there were four overmen, including Mr. John McEwan for the Carbrook section. Mr. Wallace Thorneycroft was the managing partner of the Colliery Company and was responsible for the original plans for the development of the colliery but he did not interfere with the details of the underground work. The total number employed in the mine, excluding the officials was 520 which were divided into three shifts, the day shift of 340 men which descended between 6 and 6.45 a.m. and ascended between 1.45 and 2.30 p.m., the afternoon shift of 100 men descended between 2 and 2.30 p.m. and ascended between 9.30 and 10 p.m. and the night shift of 16 to 20 machinemen and 60 others who descended between 10.45 and 11 p.m. And ascended between 6 and 6.15 a.m. The number employed in the Carbrook district, in which the explosion occurred, was about 72 of the day shift, 30 on the afternoon shift and 10 to 12 on the night shift. At the moment of the blast there were 71 men in the district. The firemen were organised in three shifts, six on the day shift, five on the afternoon shift and five on the night shift. The day shift firemen descended at 6 a.m. and came up at 2 p.m. the afternoon shift firemen descended at 2 p.m. and came up at 10 p.m. and the night firemen went down at 10 p.m. and came up at 6 a.m. To comply with section 64 of the Act, the inspections and reports were made by the firemen of the preceding shift and the fireman admitted the next shift with each fireman responsible for making two inspections and reports per shift. The firemen in the Carbrook District were William Wark on the day shift and James Watt on the afternoon shift with Andrew McLean on the night shift. The day shift was the coal drawing shift with the shotfiring done by a shot-firer but during the afternoon and night shifts, the fireman in charge did the shotfiring. Under Section 35 (2) of the Coal Mines Act, 1911, a search was required for matches etc. 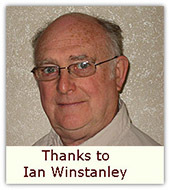 of all persons employed underground on a system that was to be approved by the Divisional Inspector of Mines. A system had been approved by which 25% of the underground workers were examined with the search being carried out by the fireman before the men were allowed to pass the Station to go to their work. The seams that were worked were the Bannockburn Main Coal and the Twenty-Inch Seams, the latter was 14 fathoms above the former. They were worked through crossmeasure drifts from the Main Coal. From No.4 shaft, the main haulage road, and an approximately parallel air and travelling way, extended at an average gradient of 1 in 12 for a distance of 1,073 yards where they met a downthrow fault. From here, two parallel cross measure drifts, dipping one in three and one in two and a half, across the fault and cutting the Twenty Inch Coal to end in the Main Coal. Continuations of these drifts, driven level in the Main Coal were known as the Torwood Levels and formed the leading places of the Carbrook District. It these levels that were affected by the explosion. The inbye ends of the Torwood Levels were 2,030 yards from the shaft and the depth of the coal seam from the surface at this point was 347 yards. In this district the Main Coal dropped 1 in 3 and was made up of 3 feet 10 inches of coal, 5 inches of dirt and 2 feet six inches of coal. All the districts in the colliery had been worked by longwall with the exception of the Carbrook Main Coal which had been opened out on the stoop-and -room method. On the rise side of the Top Torwood Level a few narrow places had been opened out and to the dip of the Lower Level, stoops had been and were being formed. Parts of the formed stoops were in the course of extraction. No coalcutters were employed in the Main Coal. The coal was holed by hand and blasted down by means of permitted explosives. The mine was ventilated by a fan forcing air down the No.3 shaft and the last measurements which were taken on the 30th. June, showed that 65,643 cubic feet per minute passed along the North Dook and 42,350 cubic feet down the South Dook. Of the quantity going down the South Dook, 27, 378 cubic feet were measured passing down the Carbrook Main Coal Level. Part of this current ventilated the Torwood Levels before ventilating the Glenside District. The other part descended the dook, rejoined the Glenside air and then passed in to the Carbrook section. Arriving there, it circulated, first through the rise places above the Upper Torwood level where it was conducted to the faces by screens. The air then passed into the Lower Level and then outbye to ventilate the stoop section in the Main Coal and the workings in the Twenty Inch Seam. The colliery was worked partly with naked lights and partly by oil safety lamps which were used in the Carbrook District from the top of the Carbrook mines. The lamp that was used was the Prestwich Patent Protector which was type which was approved by the Secretary for Mines. Firedamp had been known in the mine for many years and it appeared more frequently as the workings got deeper. For this reason safety lamps were introduced in the Carbrook Section. During the twelve months preceding the explosion the finding of inflammable gas was recorded in the firemen’s report books o 43 separate occasions. The reports indicated that the men were not allowed to enter the places where gas had been found until it had been cleared. The last record was a small quantity found I the No.3 heading, Torwood District and was cleared by ventilation on the afternoon of the day before the explosion. Coal dust was produced in working the Main Coal in the Carbrook section. Some stonedusting was done to control the dust but not to a great extent. On the morning of Thursday, 13th, July, 315 men went into the mine and 71 of these entered the Carbrook Section. At 1.25 p.m., during the seventh hour of the shift, when the shotfirer was in one of the Torwood Levels, an explosion occurred in that area, beginning inbye end and extending outbye for a distance of 300 to 450 yards. The noise of the explosion was described by the undermanager who was just entering the Lower Torwood Level at the time, as a ‘rushing noise like steam blowing out of a pipe’ while others described it as ‘a hissing noise’ or a ‘prolonged boom’. The blast did not destroy the ventilation doors in the Torwood levels, though it destroyed canvas and wood stoppings between the Upper and Lower levels. It was a local explosion and men in the stooping section immediately on the return side of the explosion area were called upon to come out of their working places. The undermanager detailed some of the workers to clear everyone out of the workings on the return side of the affected area. It so happened that a number of men were on their way to the pit bottom at the end of their shift and this helped to empty the working places very quickly. The undermanager and other officials went as far along the Top Torwood Level as possible and were successful in getting five men out who had been overcome. Unfortunately one of these men died later even though artificial respiration was administered. It was the realised the fresh air would be required to be conducted inbye before the explorers could make further progress and to this end the broken stopping were repaired as quickly as possible. Three bodies were recovered but at about 3 p.m., before any further advance had been made, a Rescue Brigade from Larbert Rescue Station arrived and two of its members, wearing breathing apparatus went in to find out about the conditions. When they returned they said that they had seen three bodies and that there was no fire inbye and no gad could be seen burning. As soon as the fresh air was carried forward, it was only matter of hours before both Levels were explored and all the bodies found. Three bodies that lay between the Top Level and the Lower Level were recovered by the Rescue Brigade. Twelve men died and four other me were affected by carbon monoxide and shock, whilst one sustained injury to the head when assisting in the rescue operations. The manager, undermanager and Day firemen were later taken ill with carbon monoxide poisoning as a result of their efforts to rescue the men and recovering the bodies. 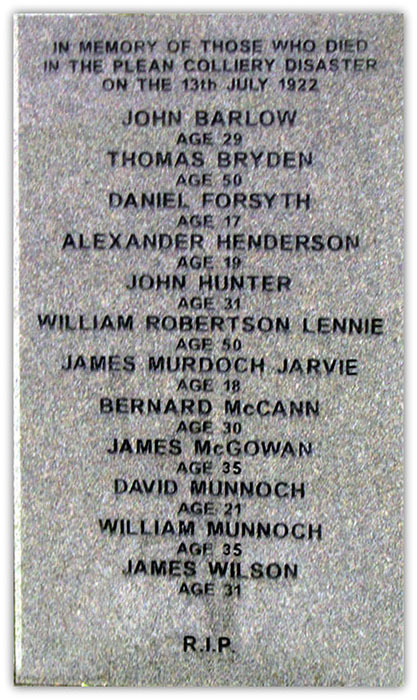 James Murdoch Jarvie aged 18 years, miner of Denny Road, Larbert. James Wilson aged 31 years. 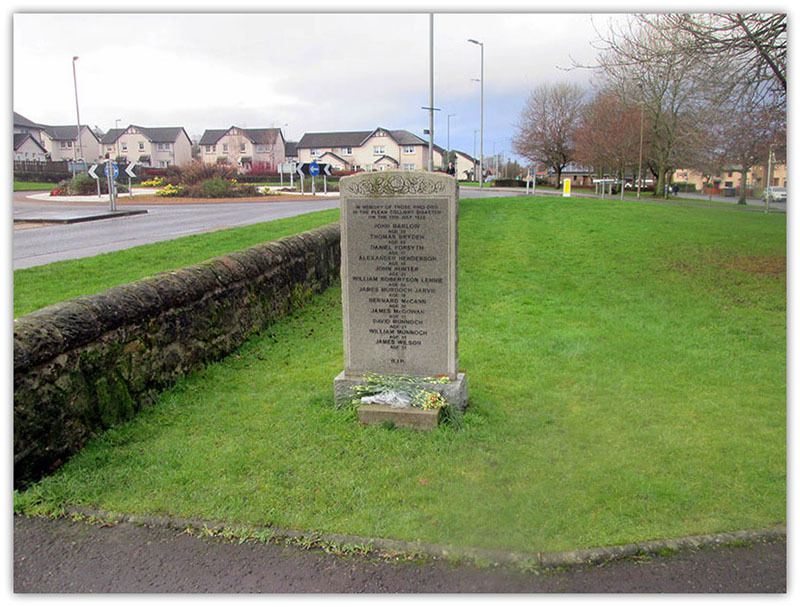 The inquiry into the disaster was held in the Sheriff Court House at Stirling and the proceedings were opened at 11 a.m. on the 17th. October and lasted until 21 when a full and detailed investigation of the circumstances and causes of the disasters was made. The Report, by Thomas H., Mottram, C.B.E., H.M. Chief Inspector of Mines was presented to Lieutenant-Colonel George Richard Lane-Fox, M.P., Secretary for Mines on the 6th. January, 1923. The explosion area was inspected immediately after the bodies had been removed by officials and Messrs. Hudspeth and Frazer, Senior Inspectors but no cause was found and a more detailed inspection was made the following day when all the gas had been cleared. There was a consensus of idea that the explosion originated at the face of No.12 heading. Two days after, when work to restore the ventilation was going on, a shot-firer’s firing key and a cable stretching out up the heading was found. One of the wires had been attached to the battery and the other had apparently been held on to or under the fixing nut and had slipped off. The body of Wilson, the shot-firer, was found 30 feet further inbye.